The Rehabilitation Centre for Children is a centre of excellence in therapy support. The program described below is a revised version of the RDI-based support that RCC has been offering for years. If you would like to learn about ways to support your child so that they feel safe and confident and are ready to explore and learn, this is the program for you. We highly recommend it! 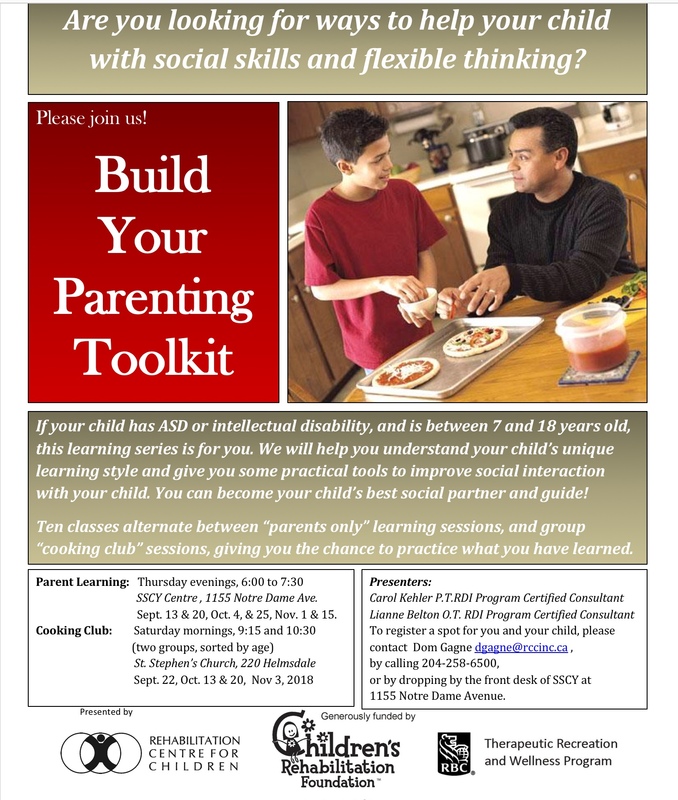 The Build Your Parenting Toolkit Program is an intensive, 10-session program for parents who have a child with ASD or another type of developmental disability, between the ages of 7 and 18. Participating children should have the ability to communicate, and to function in a group setting. There are six “adult only” group learning sessions, and four Saturday morning Cooking Club Sessions for parent and child, that will allow parents to practice with our guidance. Parents will learn about how to impact their child’s flexible thinking, communication and social skills, by making small changes to their own approach. There is no cost to parents, with thanks to the Children’s Rehabilitation Foundation. We ask that parents make plans to attend all sessions, as the knowledge and practice builds over the course of the program.